Imagine if you had to choose either one of the above and yet have to look as gorgeous? Difficult? There are little things around that speak more than the power of teamwork. The perfect outfit always doubles up to be #twiceasnice with the perfect makeup. 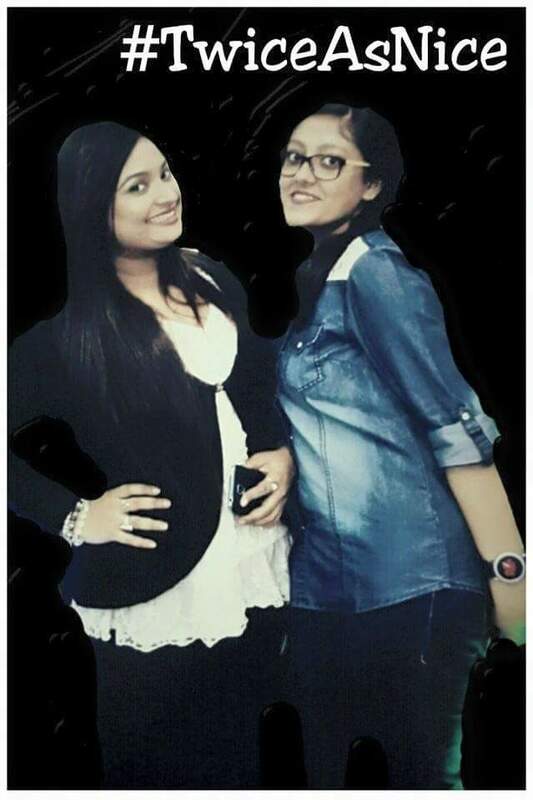 Likewise, when beauty blogger Priyanjana of Moonshine and Sunlight teams with fashion blogger Pooja of Dialifestyle, they make the Style Scene #twiceasnice together. While the former blushes and pouts with her perfectly done makeup, hair and nails, the latter poses and walks around donning the season’s trends. The knacks of both clubbed together? Do we have to say more? Undoubtedly, that makes Pooja and Priyanjana a powerful duo and when you get two good things at once you have to agree with that it indeed becomes #TwiceAsNice ! Now, with the help of each other both can dress impeccably and look gorgeous at the same time! That is what a powerful duo is all about, supporting one another! 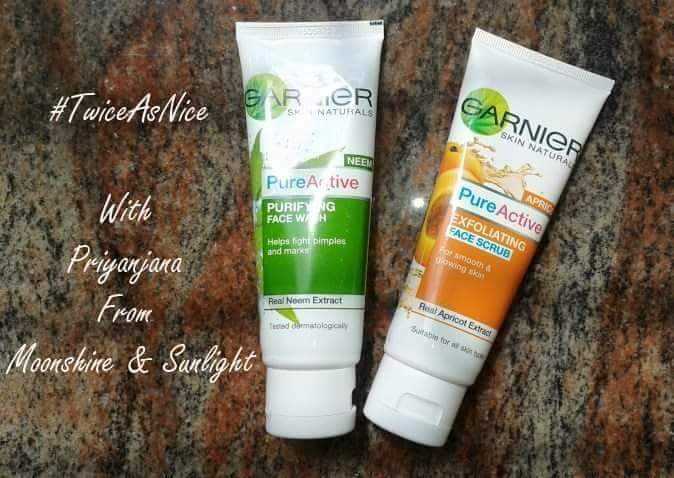 Just like the duo from Garnier, which is going to make your summer skincare power packed , for sure! The apricot face scrub and the neem face wash will together ensure that you have a clear and glow-y skin all summer. The neem face wash will fight the pesky pimples and the apricot face wash will gently remove all the dead skin cells on your skin and let your skin breath! Now let us tell you what we think about these two , individually ! First let us see what I have to say :). This has been a part of my regular skincare regime since quite sometime. Given my oily acne prone skin, this works wonders in preventing breakouts. Even if a few manage to break through, this face wash helps heal it fast. Although I haven’t seen any remarkable improvement in the marks, this does somewhat lightens them. The only con about this would be that it leaves the skin feeling extremely dry. Since I have oily skin, that feeling doesn’t last long. This is indeed a perfect companion for summer. Clubbing up perfectly with the face wash is the Apricot scrub. This is the first scrub that has not given me a breakout. The fine granules give the skin a gentle scrub fighting away all the dead cells. Although the grains are fine, they are slightly on the bigger side. They must be scrubbed gently so as to avoid scratching. But my face looks visibly clearer after each use. I haven’t been using it for long time, just a week. But, I like it because after I started to use this green colored, runny gel face wash, I haven’t had any pimples. It has not worked on my marks. It forms a mild lather doesn’t foam up. It leaves the face slightly dry though. But the face looks clear and feels really fresh! I have not been using any moisturizers after this, but I think those with dry skin will need to use a moisturizer after using this. All in all I like it but do not love it. This I have been using for a while now and I will do a detailed review on this later. But now it is time for a mini review. This is not a foamy scrub; it is a creamy scrub with lots of apricot beads. It didn’t break me out and my skin doesn’t feel dry after use at all! I think the particles are slightly too abrasive for sensitive skin.